It was around six thirty when G and I walked into Amada on our way to catch a movie. 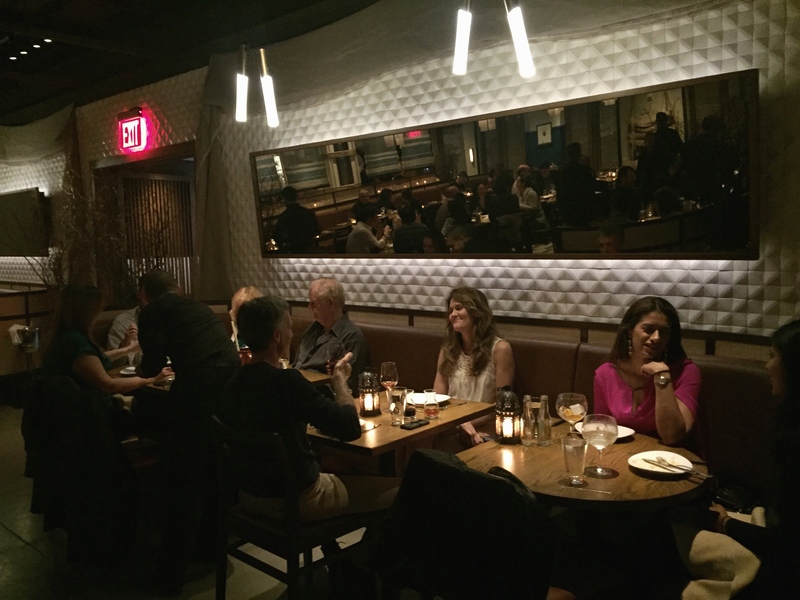 Amada, which means beloved in Spanish, is part of the Think Food Group, a collection of over 15 properties owned by José Andrés, the renowned Spanish-American chef who has been dominating the DC food scene for over 10 years. 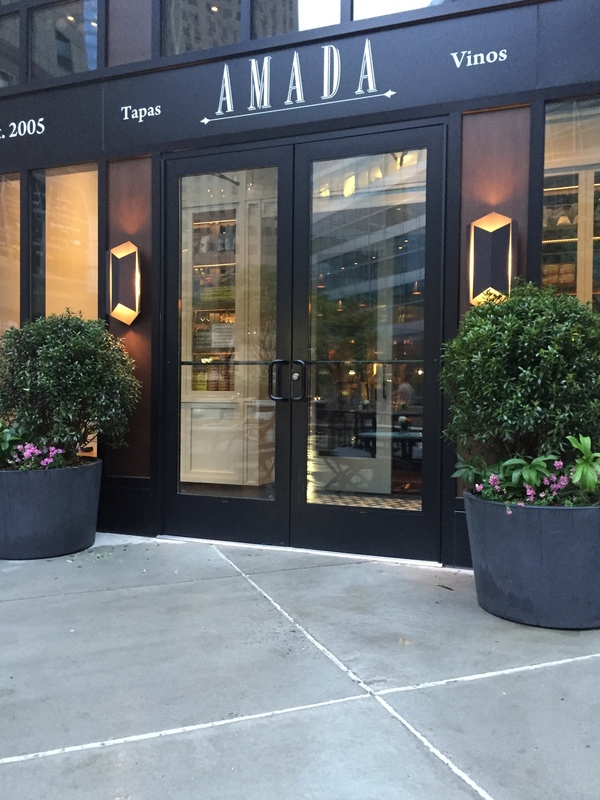 This is the third U.S. location of Amada and his first foray into the NYC restaurant scene as he warms up to open a New York concept restaurant this summer. We had no reservations, and even though we were told the restaurant was fully booked, they invited us to sit at the Chef’s Table. We thought, wow that sounds nice, envisioning delicious creations taking shape before our eyes. We were led past the bar, two dining rooms, and some empty private rooms. There were a lot of empty tables, but I figured that they would fill up in the next half hour. The lighting was moody and dim and décor was warm and rustic filled with rope decor and blue twine rugs. My dreams of experiencing first-hand creative energy were quickly crushed when I felt the heat of the kitchen, literally, and started to sweat the minute I sat down. The Chef’s Table ended up being a long counter that should have belonged to the wait staff. You could see a little bit of the kitchen, but unfortunately what we really got was the brunt of service. After some sips of a lovely sparkling rosé the heat seemed to dissipate and I focused on the menu. It included the usual suspects like tortilla española, boquerones (marinated anchovies), and callos a la madrileña (tripe stew), as well as a wide selection of ibérico hams and cheeses from Spain, but also more interesting dishes like cocas de butifarra (flatbread with catalan sausage, piquillo pepper confit, san simon cheese, spinach) and pichón con jerez (roasted squab, morels, rhubarb). Wistfully, I ordered my comfort food go-to’s: ham croquettes, garlic shrimp, and flash fried padron peppers. I would experiment later. 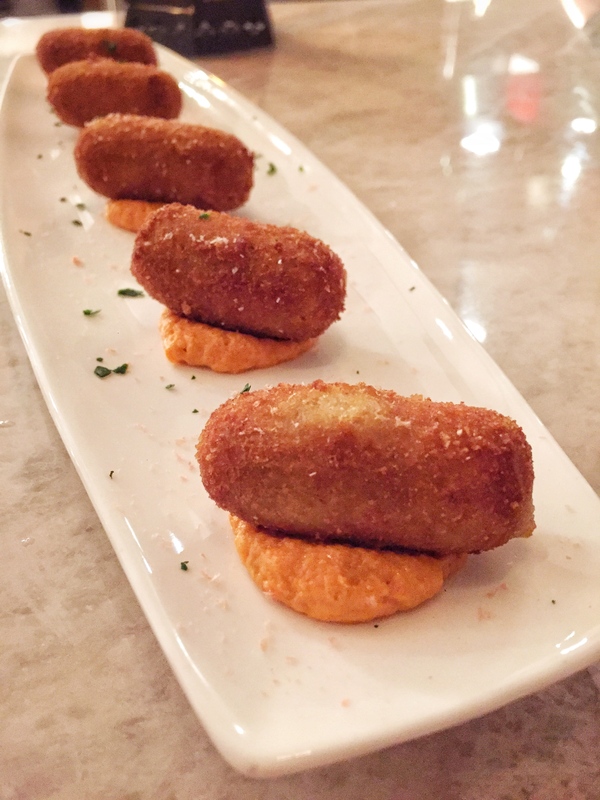 The ham croquettes had a delicate golden shell and luscious filling that was silky without being too rich. 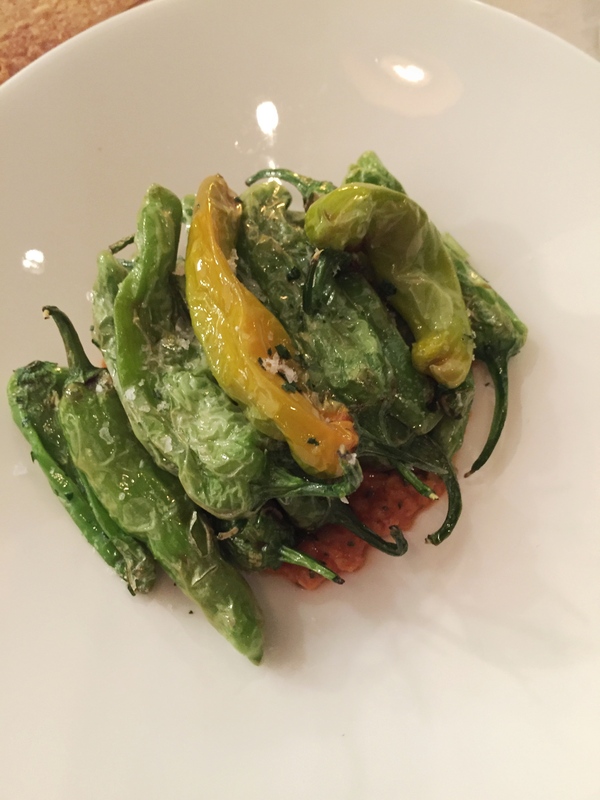 The padron peppers blistered beautifully from the grill tasted were mild and sweet, the camarones al ajillo in a terra cotta dish, sizzled temptingly in their garlic and parsley juices. Flatbread crackers with a creamy tuna dip was brought as well, courtesy of the house. We ordered some larger tapas as shareable entrees. 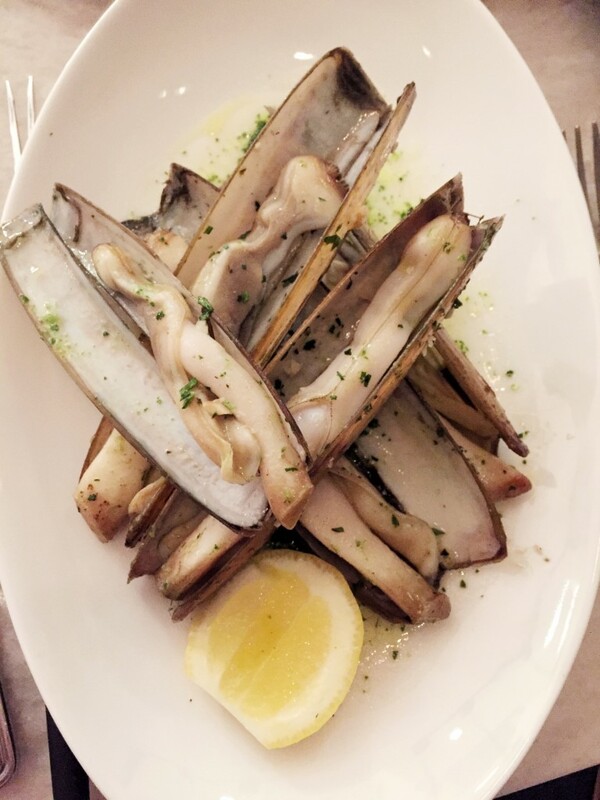 The razor clams were huge with some briny bits that were delicious but other parts just bland and sandy. The cauliflower had sufficient crunch, but the creamy sauce that dressed it was on the heavy side and lacked brightness. The meat, on the other hand, had a salty caramelized char that was totally addictive, and a tender and juicy bright red marble that left even a part-time vegetarian like myself giddy with delght. 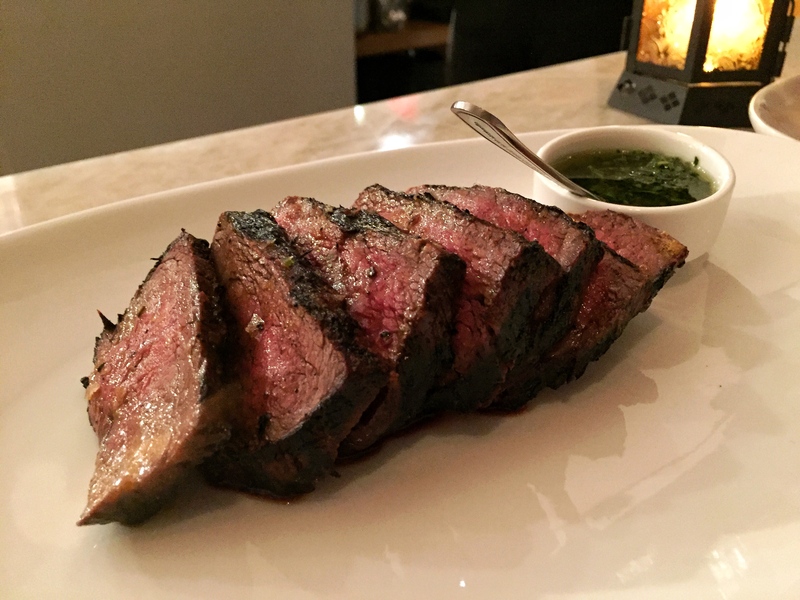 The accompanying chimichurri sauce was balanced and zesty, but the beef was so good that it felt superfluous. For bigger appetites, there’s a suckling pig and a lobster paella that I caught a glimpse of in the kitchen – it looked like a beautiful sculpture. Or a chef selection of tapas you pair with wines, called La Mesa de José. I recalled tasting one of José’s house selections at Jaleo, one of his tapas restaurants in DC, some years ago. It was a super rich sea urchin crostini with butter, and basically one of the most decadent things I’ve ever had. Hopefully, this option is just as impressive. For dessert. Amada mostly sticks to classics like churros con chocolate or torrijas, fried bread in syrup. We had to skip them altogether to make the movie, but I look forward to trying them next time. With the bill we got bite size pieces of turrón, chewy white nougat with marzipan, fit for a fete. Amada is located at 250 Vesey Street next to Brookfield Place. and now they’re open for lunch and happy hour with $8 tapas specials.